What is this thing called the SCA? The SCA is the Society for Creative Anachronism. They are an historical recreationist-type group based on the European Middle Ages and Renaissance periods (approximately 600 A.D. to 1600 A.D.), although they also include recreationists of other regions. The SCA strives to authentically reproduce the "best" of this period, without any of the yucky stuff such as The Plague or prejudices which existed. 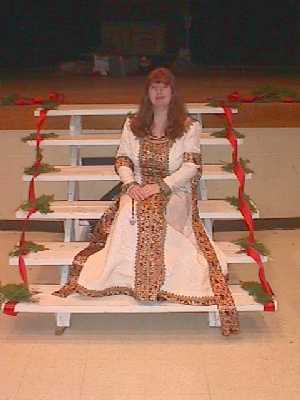 An SCA event (usually held on a weekend) might include fighting, fencing, archery, dancing, a bardic circle, arts and sciences competition, a feast, and court. Everyone makes an attempt at authentic costuming and armor, skills and set-up. DISCLAIMER: This homepage, and any information on it, is in no way endorsed by the SCA, Inc. and the opinions expressed herein are not necessarily representative of the group as a whole, or in any part (there, now that that's out of the way, the BoD won't come get me! ).